For other uses, see Black cat (disambiguation). A black cat is a domestic cat with black fur that may be a mixed or specific breed. The Cat Fanciers' Association (CFA) recognizes 22 cat breeds that can come with solid black coats. The Bombay breed is exclusively black. All-black fur pigmentation is slightly more prevalent in male cats than female cats. Their high melanin pigment content causes most black cats to have yellow (golden) eyes (irises). Any cat whose fur is a single color, including black, is known as a "solid" or "self". A "solid black" cat may be coal black, grayish black, or brownish black. Most solid-colored cats result from a recessive gene that suppresses the tabby pattern. Sometimes the tabby pattern is not completely suppressed; faint markings may appear in certain lights, even on a solid black cat. A cat having black fur with white roots is known as a "black smoke." Black cats can also "rust" in sunlight, the coat turning a lighter brownish shade. Eumelanin, the pigment that is required to produce the black fur, is somewhat fragile, so the rusting effect can be more pronounced in cats that frequently spend time in the sun. A rarer condition that can also cause rusting is a deficiency of the enzyme tyrosine, which is required to produce eumelanin. Black: dense coal black, sound from roots to tip of fur. Free from any tinge of rust on the tips. Nose leather: black. Paw pads: black or brown. Oriental – Ebony: dense coal black. Free from any tinge of rust on tips or smoke undercoat. Nose leather: black. Paw pads: black or brown. Sphynx – Black: black. One level tone from nose to tip of tail. Nose leather: black. Paw pads: black or brown. 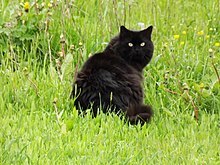 Ragamuffin – Although black is not specifically mentioned, the standard allows for "any color, with or without white," so technically speaking, an all-black Ragamuffin would be allowed under the breed standard. The folklore surrounding black cats varies from culture to culture. Scottish lore holds that a strange black cat's arrival to the home signifies prosperity. In Celtic mythology, a fairy known as the Cat sìth takes the form of a black cat. Black cats are also considered good luck in the rest of Britain and Japan. Furthermore, it is believed that a lady who owns a black cat will have many suitors. In Western history, black cats have typically been looked upon as a symbol of evil omens, specifically being suspected of being the familiars of witches, or actually shape-shifting witches themselves. Most of Europe considers the black cat a symbol of bad luck, particularly if one walks across the path in front of a person, which is believed to be an omen of misfortune and death. In Germany, some believe that black cats crossing a person's path from right to left, is a bad omen. But from left to right, the cat is granting favorable times. In the United Kingdom it is commonly considered that a black cat crossing a person's path is a good omen. The black cat in folklore has been able to change into human shape to act as a spy or courier for witches or demons. When the Pilgrims arrived at Plymouth Rock, they brought with them a devout faith in the Bible. They also brought a deepening suspicion of anything deemed of Satan and were a deeply suspicious group. They viewed the black cat as a companion, or a familiar to witches. Anyone caught with a black cat would be severely punished or even killed. They viewed the black cat as part demon and part sorcery. [unreliable source? ]These superstitions led people to kill black cats. There is no evidence from England of regular large-scale massacres of "satanic" cats, or of burning them in midsummer bonfires, as sometimes occurred elsewhere in Europe. In contrast, the supernatural powers ascribed to black cats were sometimes viewed positively; for example, sailors considering a "ship's cat" would want a black one because it would bring good luck. Sometimes, fishermen's wives would keep black cats at home too, in the hope that they would be able to use their influence to protect their husbands at sea (see Ship's cat). The view of black cats being favorable creatures is attributed specifically to the Egyptian goddess Bast (or Bastet), the cat goddess. Egyptian households believed they could gain favor from Bastet by hosting black cats in their household. This view was held in the early 17th century by the English monarch Charles I. Upon the death of his treasured pet black cat, he is said to have lamented that his luck was gone. True to his claim, he was arrested the very next day and charged with high treason. Pirates of the 18th century believed that a black cat would bring different kinds of luck. If a black cat walks towards someone, that person will have bad luck. If a black cat walks away from someone, then that person will have good luck. Conversely in the United Kingdom if a black cat walks towards someone, it is said to bring good fortune, but if it walks away, it takes the good luck with it. If a black cat walks onto a ship and then walks off it, the ship is doomed to sink on its next trip. Black cats have been found to have lower odds of adoption in American shelters compared to other colors except brown, although black animals in general take more time to find homes. The reasons given include not only superstition, but also the perception of black as "boring" compared to other colors as well as the belief that black cats don't photograph well. Some shelters also suspend or limit adoptions of black cats around Halloween for fear they will be tortured, or used as "living decorations" for the holiday and then abandoned. Despite this, no one has ever documented in the history of humane work any relationship between adopting black cats and cats being killed or injured. When such killings are reported, forensic evidence has pointed to natural predators, such as coyotes, eagles, or raptors as the likely cause. Limiting or suspending adoptions around Halloween also places more cats of all colors at risk of dying in shelters due to overcrowding. August 17 is "Black Cat Appreciation Day." Wayne H. Morris created the day in honor of his late sister, June, who had a black cat, Sinbad. The day was chosen in memorial of June's passing. In the early days of television in the United States, many stations located on VHF channel 13 used a black cat as a mascot in order to make sport of being located on an "unlucky" channel number. Since the 1880s, the color black has been associated with anarchism. The black cat, in an alert, fighting stance was later adopted as an anarchist symbol. Here is the other patch the crew made for STS-41-C which would have been STS-13, and it landed on Friday the 13th. When the Space Shuttle program naming system for missions was reworked to avoid an STS-13, some sourced this to superstition and Apollo 13. 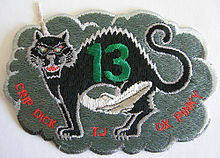 The crew for what would have been STS-13 (what turned out to be STS-41C) made a humorous mission patch that included a black cat and a number 13. The mission was successful and even landed on Friday the 13th. The other main reason for the new numbering system was to better accommodate a much higher number of launches. Pluto, Edgar Allan Poe's "The Black Cat"
The Bombay cat breed is typically black in colour. October 27 has been designated 'Black Cat Day' by Cats Protection in the United Kingdom of Great Britain and Northern Ireland, to celebrate the virtues of black cats and to encourage people to adopt an unwanted black cat. Cats Protection's own figures suggest that black cats are more difficult for them to find a new home for than other colours. In 2014, the RSPCA reported that 70% of the abandoned cats in its care were black, suggesting a possible reason was that people considered black cats "un-photogenic". In the United States, "Black Cat Appreciation Day" is August 17. Research by the ASPCA shows that black cats are the least likely to be adopted from shelters of any type of cat. This can be partly because of the superstition behind black cats such as their association with witchcraft or bad luck, or because they appear dull next to more colorful cats. In 2014 Toronto, Canada's largest city, held an event on Black Friday during which people could adopt a black cat without paying the usual $75 adoption fee, in order to encourage the adoption of black cats. This trend had now spread across the United States, with many shelters offering free adoption of black cats on Black Friday. With the success of the 2018 African-themed Superhero film, Black Panther, there was a fad of adopting black domestic cats as pets and naming them after various characters of the film such as T'Challa and Shuri. It has been observed that usually people were not going out of their way to follow this fad, but visited animal shelters to simply adopt a pet under normal circumstances and were inspired by the Black Panther to adopt a black cat when they see one. Regardless, to reduce the chance of such cats being abandoned when the fad fades, reputable animal shelter personnel took the usual precautions of having potential adopters fill out questionnaires to weed out potentially abusive guardians and have them read literature about the needs and responsibilities of such a pet to dissuade the less conscientious. ^ Hackett, Stacy N. (2015-08-17). "Black Cat Breeds and History". CatChannel.com. Archived from the original on 2015-09-06. ^ a b "Cat Colors FAQ: Common Colors". Cat Fanciers Chat (fanciers.com). Archived from the original on 2011-10-09. Retrieved 2011-10-08. ^ "Why Is My Black Cat "Rusting"?". Paws and Effect. 2015-09-13. Retrieved 2018-03-02. ^ Syufy, Franny. "Facts About Black Cats". About.com. Archived from the original on 2011-10-09. Retrieved 2011-10-08. ^ "Superstition Bash Black Cats". Amherst, New York: Committee for Skeptical Inquiry. 2011. Archived from the original on 2011-10-09. Retrieved 2011-10-09. ^ Singer, Jo (2009). "Black Cat Myths". PetSide.com. Archived from the original on 2011-10-09. Retrieved 2009-11-29. ^ "Black Cats... Do black cats mean good luck or bad luck for you?". Best-Cat-Art.com. 2011. Archived from the original on 2011-10-09. Retrieved 2011-10-09. ^ a b "Black Cats and Cats in General". Superstitionsonline.com. 2012-01-19. Archived from the original on 2015-04-01. ^ Miller, Mary Ann (2011). "The Mystique Behind Black Cats". The Cat Site.com. Archived from the original on 2011-09-27. Retrieved 2011-09-26. ^ "A Dictionary of English Folklore". Oxford University Press. 2000. Retrieved 2009-11-25. ^ Parkinson, Ann. "Black Cats". Love To Know Cats. Archived from the original on 2011-10-09. Retrieved 2011-10-09. ^ Lepper, Merry; Kass, Philip H.; Hart, Lynette A. (2002). "Prediction of adoption versus euthanasia among dogs and cats in a California animal shelter" (PDF). Journal of Applied Animal Welfare Science, 2002;5(1):29-42. School of Veterinary Medicine University of California. Archived from the original (PDF) on 2006-09-25. ^ a b Jennifer Wilber (2018-07-19). "Why You Should Celebrate Black Cat Appreciation Day on August 17th". holidappy.com. Retrieved 2018-11-04. ^ Rodriguez, Rachel (2014-10-31). "To be a black cat on Halloween". CNN. Archived from the original on 2014-10-31. ^ Mikkelson, Barbara; Mikkelson, David (2005-10-27). "Cat o'Nine Tales". Snopes.com. Archived from the original on 2011-10-09. Retrieved 2011-10-08. ^ a b Boks, Ed (2010-10-06). "The truth about black cats and Halloween". The Daily Courier. Prescott, Arizona. Archived from the original on 2011-09-25. Retrieved 2010-10-10. ^ Crump, Morgan (2011-10-25). "Humane Society refuses black cat adoption during Halloween season". dailytoreador.com. Archived from the original on 2011-11-05. Retrieved 2011-10-26. ^ Marty Becker, DVM (2012-10-26). "Are Black Cats in Greater Danger Around Halloween?". vetstreet.com. Retrieved 2018-11-04. ^ Mills, Jeremy (2011-08-15). "Black Cat Appreciation Day is August 17". Lynchburg, Virginia: WSET.com. Archived from the original on 2011-08-18. Retrieved 2011-08-17. ^ O'Day, Robin (2012-08-17). "Black Cat Appreciation Day for animal shelters". Missoula, Montana: KPAX.com. Archived from the original on 2014-08-17. Retrieved 2012-12-13. ^ "IWW Union Dictionary and Glossary". Chicago, Illinois: Industrial Workers of the World. 2005-05-01. Archived from the original on 2011-10-09. Retrieved 2011-10-09. A symbol for "sabotage" (i.e. inefficiency at the point of production by disgruntled workers), usually represented by a black cat with bared teeth. Also called "sab kitty", "sabo-tabby", or "the cat". ^ a b c d Almeida, Andres (5 December 2016). "Behind the Space Shuttle Mission Numbering System". Nasa.gov. Retrieved 15 December 2017. ^ a b "National Black Cat Day 2015". Cats Protection. 2015. Archived from the original on 2015-10-05. Retrieved 2015-10-18. ^ Arkell, Harriet (2014-07-29). "Hundreds of black cats are being abandoned by their owners because they don't look good in selfies". Daily Mail. Archived from the original on 2015-10-31. Retrieved 2015-10-18. ^ Hooten, Christopher (2014-07-30). "Black cats being rejected because they don't look good in selfies, says RSPCA". The Independent. London. Archived from the original on 2015-04-05. Retrieved 2015-10-18. ^ a b "Black Cats — The Good, The Bad, and The Misunderstood". Las Vegas, Nevada: The Animal Foundation. n.d. Archived from the original on 2016-10-28. Retrieved 2016-10-27. ^ Declerq, Katherine (2014-11-22). "Adoption fees being waived for black cats at shelters". Toronto Star. Toronto, Ontario. Archived from the original on 2016-04-10. Animal Services will be hosting a “cat adoption blitz” in honour of Black Friday. The $75 adoption fee will be waived from four different animal shelters across the city, as well as at a number of partner locations. The only cost to adopt a black cat will be a $15 license fee. ^ Ahsan, Sadaf (28 February 2018). "Thanks to Black Panther, there's been a reported rise in black cat adoptions". The National Post. Retrieved 2 March 2018. ^ Chorney, Saryn (27 February 2018). "A Kitten Named Wakanda? Black Panther Is Inspiring Animal Lovers to Adopt Black Cats". People Magazine. Retrieved 2 March 2018.